Sputnik 1 was launched 53 years ago, on October 4th, 1957. In many ways, it can be seen as the launch of the space age. Being the first man-made satellite to orbit Earth, it started the space race which led to Buzz and Neil landing on the moon in 1969 and contributed to the demise of Communism. Most of the people writing nowadays about space weren't alive yet in 1957, myself included. As such, we cannot fully grasp the feelings that swept through the United States of America knowing a USSR made object was flying invisible and uninterrupted above its skies. However, from the events which proceeded it is obvious, to put it mildly, that it was a very big deal. Similarly to the first successful Wright brothers flight at Kitty Hawk NC, this was a modest beginning. 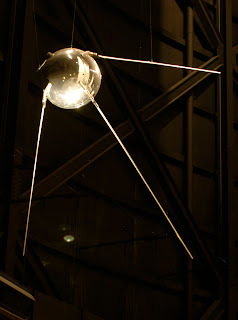 Sputnik had some radio capabilities, short 22 day battery life and limited scientific capabilities. However, it was the eye opener that ignited decades of advancements and discoveries, the proof of the entire concept, which today is a versatile tool for both looking out to space and looking at Earth, helping us understand our pale blue dot, the solar system and far beyond. Satellites today are not limited, of course, to scientific research. They are directly involved with our daily lives here on Earth. GPS, TV and weather forecast are but some aspects of our daily lives largely enabled by satellites, much more sophisticated than the beep-in-the-sky of 1957, all results of innovation and ingenuity. Most satellites are very expensive, take years to build and belong to large corporations or governments. However, over the last decade a growing number of small satellites have been being built by universities and companies called CubeSats. A CubeSat is a 10cm cube and weighs up to 1 Kilogram, much smaller and lighter than most satellites. A standard kit has been created, which simplifies creation of a CubeSat, allowing students, researchers and companies put payloads in orbit in less than a year from inception to launch. If it's your cup of tea, you can track many of the about 2,500 satellites with the help the NASA Satellite Tracking page. Even if you don't generally look up, remember Sputnik the next time you check where a hurricane is heading, go on a road trip using your GPS instead of paper maps or just watch one of the hundreds of channels of TV available today. I am involved with an attempt at the N-Prize. Basically 50 odd years later getting a mini sputnik into orbit for less than $1,500. Sputnik was important at the time and so is the n-Prize - revolution in Space! Backyard science. DIY to orbit. Interesting to say the least.